Wayne Waddell was born in 1935 in Bremen, Georgia. He was commissioned through the Air Force ROTC Program at Georgia Tech on June 9, 1956, and went on active duty beginning June 3, 1957. Lt Waddell completed Undergraduate Pilot Training and was awarded his pilot wings at Laredo AFB, Texas, in September 1958, and then completed all-weather interceptor training in the F-86 Sabre at Moody AFB, Georgia. He remained as an instructor pilot at Moody AFB until December 1960, and then served as an instructor at Craig AFB, Alabama, from January 1961 to June 1965. 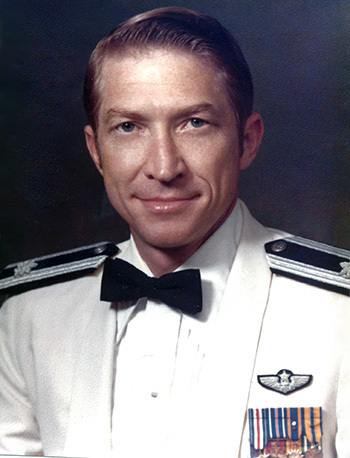 Capt Waddell then received an Air Force Institute of Technology assignment to complete his Masters Degree at the University of Southern California from June 1965 to September 1966. After completing F-105 Thunderchief Combat Crew Training, he was assigned to the 354th Tactical Fighter Squadron of the 355th Tactical Fighter Wing at Takhli Royal Thai AFB, Thailand, in April 1967. Maj Waddell was forced to eject over North Vietnam and became a Prisoner of War while flying his 47th combat mission on July 5, 1967. After spending 2,070 days in captivity, he was released during Operation Homecoming on March 4, 1973, and then attended Air War College at Maxwell AFB, Alabama. Col Waddell then remained on the faculty of the Air War College until 1975, when he transferred to the Pentagon and worked on the Department of Defense Joint Service Committee on Air Munitions Standardization from 1975 to 1979. His final assignment was as director of U.S. Air Force Emergency Plans for the Eastern United States at Dobbins AFB, Georgia, from 1979 until his retirement from the Air Force on October 27, 1987. Col Waddell served as President of NAM-POWs Corp, the Organization of former Vietnam Prisoners of War, from 1981 to 1984. Major Dewey W. Waddell distinguished himself by gallantry in connection with military operations against an opposing armed force as an F-105 Pilot over North Vietnam on 5 July 1967. On that date, Major Waddell was a member of a flight of F-105s which attacked and destroyed a key hostile railroad yard. The target was defended by one of the most accurate concentrations of antiaircraft artillery in North Vietnam. Even though he received several direct hits from the deadly flak, Major Waddell continued his attack until he delivered his ordnance. 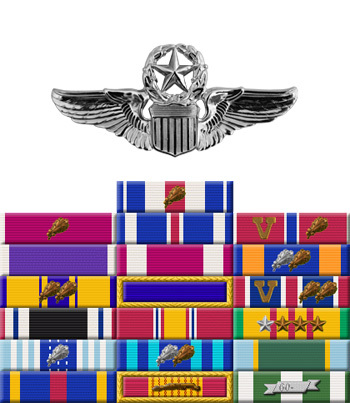 By his gallantry and devotion to duty, Major Waddell has reflected great credit upon himself and the United States Air Force.